Camp for €18,- a night at Ladram Bay Holiday Park in low season with CampingCard ACSI. 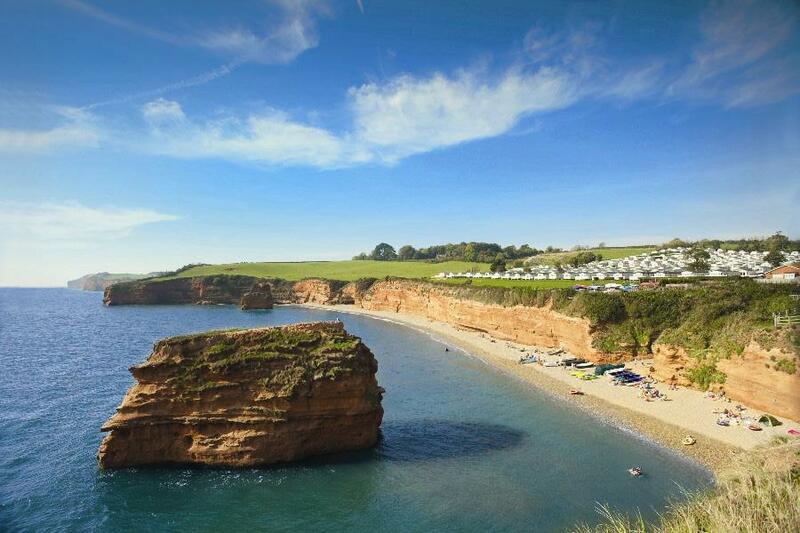 Ladram Bay Holiday Park, located in Otterton (Devon), is a campsite with 90 touring pitches and 95 year round pitches. With your CampingCard ACSI you can camp on one of the pitches during the following periods: 15-03-2019 - 06-04-2019, 01-05-2019 - 24-05-2019, 03-06-2019 - 13-07-2019 and 02-09-2019 - 03-11-2019. At this campsite you can not only use your CampingCard ACSI for inexpensive camping, you can also use your ACSI Club ID (as an alternative ID). Large terraced campsite on a beach with beautiful views of the sea. Paved pitches with water and drainage connections. Many amenities and activities including watersports, indoor pool, bowling, disco, adventure playground and supermarket. We have a touring caravan and don't leave our dog unattended as not good practice. There are good walks nearby, but not on the beach and there weren't any areas in the bars etc that allowed dogs. So will not be back. Stayed for 2 nights in May 15, level fully serviced pitch, caravan was towed on by staff (compulsory), be wrned you need very long waste and fresh water pipes to reach the services on many pitches due to poor design of the pitches. The SW coast path runs through the site and is spectacular to walk, very good if you have a dog as no dedicated dog walk on site. Food in the restaurant was very good and reasonably priced. Toilets were very clean. We will revisit. A large holiday centre with extensive areas of fixed mobile homes & chalets, semi static & touring caravans and a zone for motorhomes. Might be too crowded in high season but during early summer was a great stop over in our motorhome. Excellent staff and facilities, good pitch and toilet block. Great location in a valley within 500m of pebbly beach. Walk along the coastal path to Sidmouth through lovely countryside with stunning cliff top views. In 31 years of caravan touring this campsite is the most complete campsite and well serviced I have ever been on. The toilet & washblock was superb, underfloor heated, spacious shower and plenty hotwater. That site tractor put the van on the fully serviced pitch, great views out to sea. A stunning bargain. Just had a 2 night stay with our camper van.Pitch was excellant,level with a seaview.Showers and toilet block were immaculate.Very child friendly.Staff were all very obliging and pleasant. Would you like to book Ladram Bay Holiday Park or request more information? You can do both using the information below or by visiting the campsite's website. From M5 exit 30, then A3052 direction Sidmouth. Right at Newton Poppleford onto B3178 direction Budleigh Salterton. 1.5 km past Colaton Raleigh left towards Otterton. Campsite signposted in Otterton. CampingCard ACSI will send your information request to "Ladram Bay Holiday Park".